3M bumps up its dividend for the 55th consecutive year. If you're a dividend investor and haven't been following shares of 3M (NYSE:MMM) then you're doing something wrong. After the market closed yesterday the company increased its dividend to $0.635 per share, an 8% increase. This is the 55th consecutive year 3M has increased its dividend and the 96th consecutive year the company has paid dividends. To put icing on the cake, the company announced a $7.5 billion share repurchase program, which could buy back more than 10% of the company's stock. We've seen a renewed focus on dividends at some of the largest companies in the U.S. recently, and investors are reevaluating these companies. Since the recession there have been fewer growth opportunities in large markets like the U.S. and Europe, and forward-thinking companies were already heavily invested in growth markets like China and Latin America. The next best alternative for cash is paying investors back with dividends. Conglomerates like General Electric (NYSE:GE) and Johnson & Johnson (NYSE:JNJ) are in the same boat as 3M. 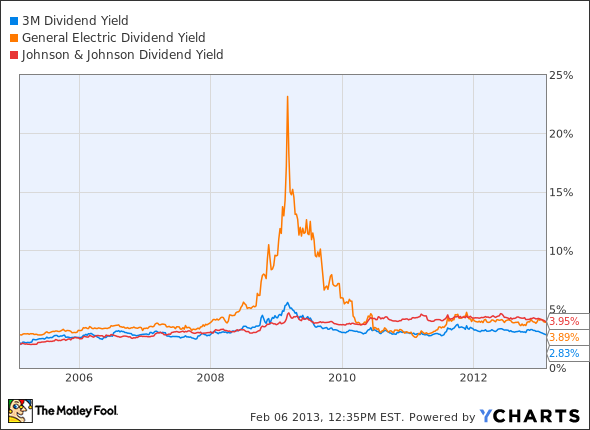 As growth has slowed dividend yield has gone up and investors look for cash instead of growth. Like 3M, GE bumped up its quarterly payout by 12% over the past few months to $0.19 per share. It also approved an increased share buyback by $10 billion. Johnson & Johnson did the same thing with a 7% increase in its dividend last year. A little more than a decade ago, 3M, GE, and J&J would have been considered growth stocks, commanding high P/E ratios as leaders of their industries. Now investors look at them for nothing more than consistent earnings and a solid dividend yield. 3M also named Coca-Cola CEO Muhtar Kent to its board of directors.